OK, we’ve just about had enough! Between all the newsgroup posts, and John Marshall’s nagging, it’s time to do something about adding text to a circle in Visio. ‘Til now, the standard response has been; “insert a Word Art object”. But with Visio’s SmartShape- and automation capabilities that just won’t do! We ought to be able to build something cool–and more native to Visio. This article presents the first in a series of the Circular Text Generator! 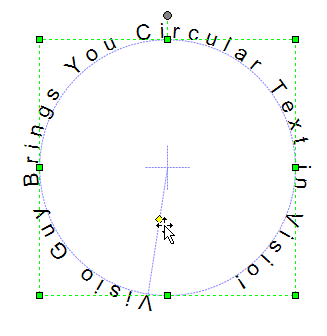 Be sure to check out the latest incarnation of text on a circle in: Text on a Circle Visio Shape. It offers a self-contained shape that works without VBA macro code, and can be freely edited without the “regeneration” step offered by this article’s tool. The companion download at the end of this article contains a zipped Visio file that will help you create text that wraps nicely around a circle! You can resize the circle, format the text, and reposition the text’s starting point to get just the look that you want! But in order to get the “generator” to work, you’ll need to allow the VBA macros inside of the document permission to run. If you’re not familiar with VBA macros, and the related security issues, please have a look at VBA Macro Security first. Once you’ve downloaded the file, opened the document, checked the code, and enabled the macro code to run, you’ll be ready to rock-n-roll! Since the characters are separate shapes, you can simply select any number of them by either dragging a selection net around the characters, or by Shift + Clicking individual letters. The formatting of the characters is not locked in any way, so you can change the color, style and size of each character. You can even change the character itself, although there is no way to edit the whole message. If you need to change the text, simply create a new system by clicking the button. We hope you find version 1 of the Circular Text Generator useful and easy-to-use. We will be periodically enhancing the capabilities of the tool, so check back often! Update: There’s a new version available. This article still applies so be sure and read it, but go to Circular Text Generator (version 2) to get the latest features! Visio Nerd Videos – For Developers! Very impressive! Nice work, Chris. Could something similar be created to put the text inside the circle? This is something I have been looking for in Visio for some time – thanks! I’m planning to add features to this over the coming months. One of those features will be to be able to shift the “baseline” so you can move the text in and out with respect to the circle. Another thought on the circular text generator – have a radio button that selects “clockwise” or “counter-clockwise” for the text direction. Great site and great stuff mate… I was really trying hard for the circular arrows and text and you’ve just delivered me right out of my mess. Is there any way to “hard set” or enter the starting angle in a control box on the text start handle? After adding text it becomes more difficult to get precise control – 45 degrees, 90 degrees, etc. This will make it easy to push the yellow handle around, but you won’t see what you’ve done until you let the mouse button up. Have been after this for a long time now. Thanks again. Great Tool. Seems unfair to ask for adjustments, but I will anyways. How can I make the set the letters to be closer together. I need to be able to squeeze more text into one slice (arc) of the circle. Kudos on this script. It has helped my group at work significantly with some graphics we are making. I too am interested in the additional functionality when you get to it – The ability to write inside the circle as well so that you can curve text down or up. This “Gem” of an article has disappeared from the front page and the archive page – I had to access it from the “Index” page. Any updates as Christmas has just past? Great work! Is there any hope for older versions (Visio 2002) or perhaps posting the script? You have helped me find a bug in my archive code. This article had indeed disappeared! Please upload the new version – love to give it a spin. At last an ongoing problem is solved! Thanks so much for this text generator. See version 2 of this tool. 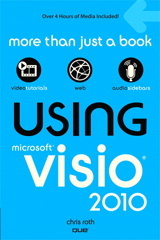 There’s a Visio 2002 version posted there. looks great. will enjoy the tools. thanks for the problem solving soultion. I am looking for a way to generate a graphic from text (from a file) in a diminishing circle. To visualize what I am talking about imagine looking at your backup CD and seeing alist of files on the disk, starting at the outer edge and circling around and gradually moving toward the center of the disk. Has anyone seen a utility like this? You could use the second version of this tool, Circular Text Generator (version 2), and create many concentric circles, but I think you wanted a spiral text effect. 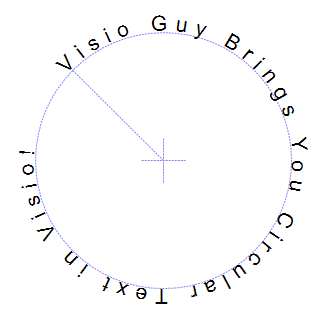 There is a spiral generator on Visio Guy, here: Spiral Shape Maker, but it doesn’t do any text. If you are handy with VBA code, you might be able to modify it. I just like to say I think this tool is brilliant. Is there any way to get the text inside the circle so that it arcs the other way. 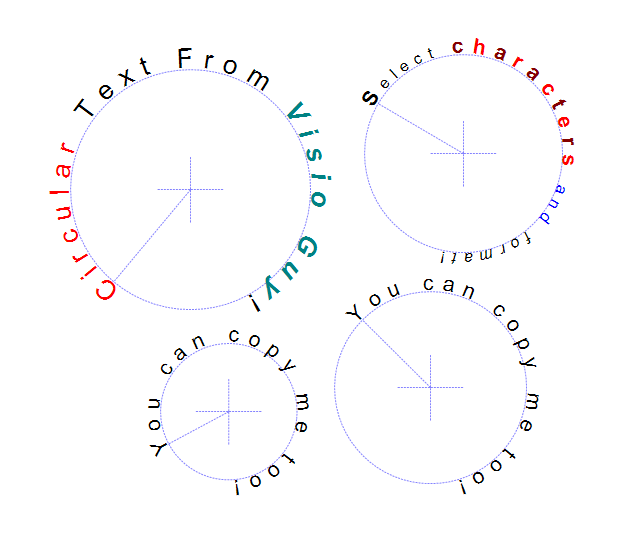 See the newer version: Circular Text Generator (version 2). It does what you need! I see that you commented on version 2. Does that mean you’ve figured this out? 1. I tried to register myself here, but the e-mail with password is not being sent correctly (tried twice with two different usernames and e-mail accounts). Nothing. What’s wrong? How can I register? No idea what’s wrong. Did you check your junk/spam folders for the original registration confirmation? I just made a test user with my gmail account and it worked just fine. looks great … but how do I use this in an existing document? 1. Use the download document to creates some text. 2. Copy and paste the text (with the guide!) to your new drawing. Though the version 2 is out, i still want to have the version 1. Can someone guide me to the download link ? No, version 1 has been discontinued. Version 2 is pretty much the same, except it has a few additional parameters and features.